A passenger was arrested by the customs officials at Rajiv Gandhi International Airport (RGIA) for illicit possession of gold on Wednesday. 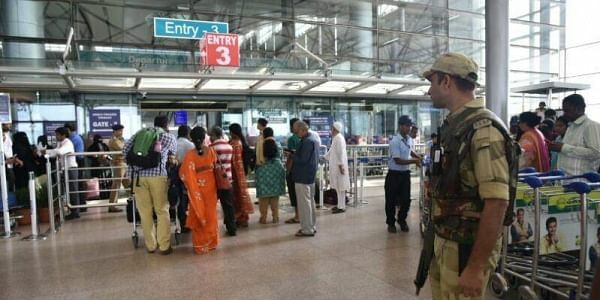 HYDERABAD: A passenger was arrested by the customs officials at Rajiv Gandhi International Airport (RGIA) for illicit possession of gold on Wednesday. The customs personnel seized 800 grams of gold, worth Rs 26 lakh, from the passenger. According to sources, 809.92 grams gold of 24 KT purity, worth Rs 26.1 lakh was concealed in a popcorn maker and foot massager and kept in the checked-in baggage of the passenger. The contraband was detected by the air intelligence unit officials of RGIA. The passenger was travelling from Dubai to Hyderabad. In a similar case, the customs officials detained yet another passenger on Wednesday, for smuggling 349.35 grams of 24 KT gold, worth Rs 11.3 lakh, concealed in the form of dials of three wrist watches. On the same day, the customs personnel seized 30,000 sticks of foreign cigarettes of different brands such as Gold Flake, Mond Super Slims and Bensons & Hedges.